After a few years of big phone mania, Apple’s finally giving us a phone that will fit comfortably in a woman’s pocket. It’s got the same guts as an iPhone 6s, minus the size, and it looks an awful lot like the iPhone 5s—to the point that all the comparisons in the announcement were to the 5s and not the 6s. This phone is, from the outside, just an iPhone 5s. Same 4-inch display, and same glass back and vaguely industrial lines and none of that curved glass nonsense on the front that has led to the iPhone 6 and 6s breaking every time they even look at the ground. There was a lot of back and forth over what kind of camera the SE would carry. Now we know. 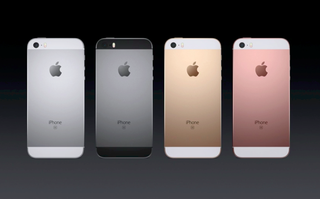 It’s got the same camera setup as the 6s, including a 12 megapixel sensor and 4K video support. That also means Live Photos, solid focusing speed via “focus pixels” and True Tone Flash—which brightens the display for better lit selfies. The iPhone SE packs in an A9 processor and M9 co-processor so you’d be hard-pressed to tell the difference between it and the 6s. But for folks still clinging to their iPhone 5S this is a major, major upgrade. There is, however, a distinct lack 3D Touch discussed—so that might be out. Those 5S owners won’t even notice, but they’ll likely be all about the improved wifi, the SE includes updates to AC wifI, and improved LTE speeds—allegedly 50 percent faster that the iPhone 5s. The 16GB iPhone SE will go for $400 while the 64GB variation will go for $500. The 16GB version will be free with a 2-year contract or $17 a month over two years that puts it at the bottom end of the price spectrum of iPhones, despite being a little more powerful that the iPhone 6. It will be available for purchase at midnight March 24 (this Thursday), and available in stores March 31.